Lady's coat is not quite stringy-looking enough to require a brushing. 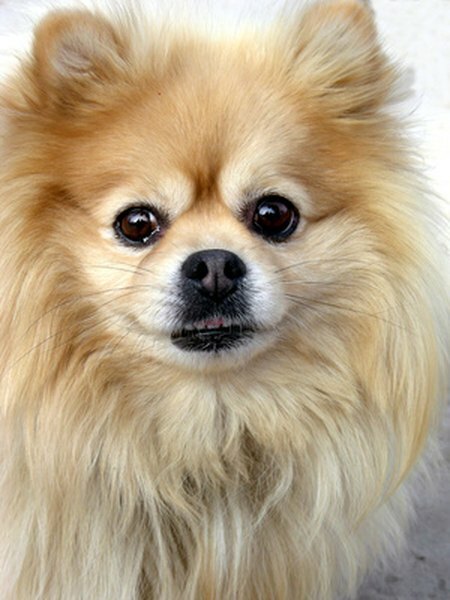 Your Pomeranian's fluffy double coat is what makes him look like a stuffed animal; it's also why his fur tangles so easily. Resolving snarls early prevents them from becoming painful mats. Weekly brushing is an effective preventative measure, but severe tangles require more than simply running a comb through the pooch's hair. 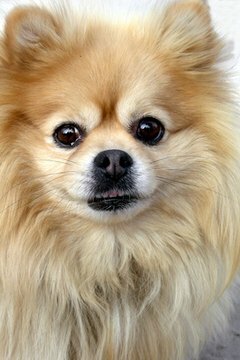 Isolate a few inches of your Pomeranian's fur and lightly spritz it with a bottle of watered-down dog conditioner. Aim for damp, not saturated, hair as you spray. The diluted conditioner makes your dog's hair slippery and easier to untangle. Start brushing the section of dampened hair at the tip, using a slicker brush. The rounded metal bristles of a slicker brush gently separate tangled fur while removing loose strands. For severely tangled hair, begin by brushing only the bottom inch. Continue brushing that same inch until the slicker brush moves easily through the Pom's hair. Begin brushing the next inch of hair directly above the inch of fur you just untangled. Gradually untangle each section while moving closer to the skin. This method, commonly referred to as "line brushing," allows you to methodically untangle your Pomeranian's fur without causing him pain and without cutting or shaving entire chunks of tangled or matted hair. Separate the next section of hair and repeat steps 1 through 3. Bathe and blow-dry him only after you've completely untangled and clipped his coat, or you could make the snarls worse. If the tangles seem thick but not solidly matted, massage the hair with your fingers after spraying the conditioner and before using the slicker brush. Give your dog a treat every few minutes as you work to untangle his flowing locks. Untangling works for your Pomeranian's snarls and snags, but shaving or clipping is often the only option for solid hair mats sitting close to his skin.